Thanksgiving isn’t Thanksgiving without brussel sprouts, am I right? I think so, anyways! 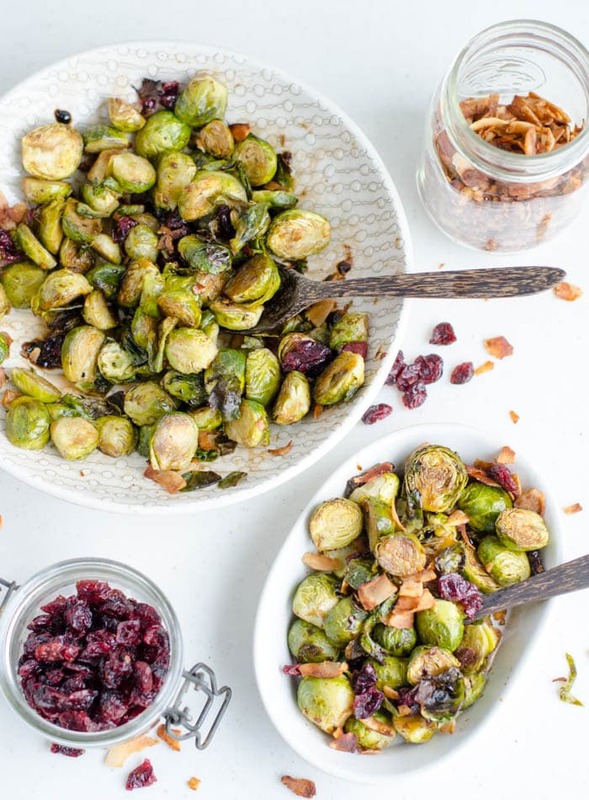 These roasted brussel sprouts with balsamic maple glaze, coconut bacon, cranberries and are next-level. 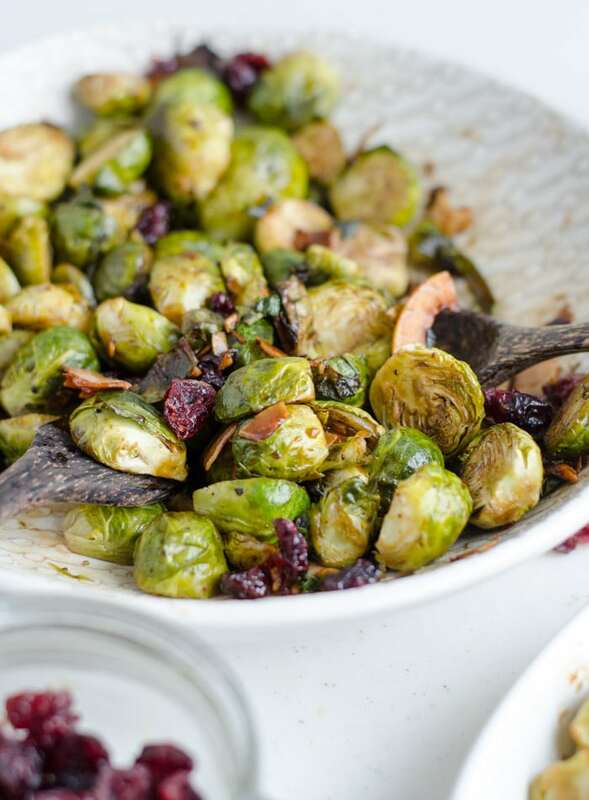 They’re more decadent than your everyday brussel sprouts making them the perfect side for your Christmas, Easter or Thanksgiving holiday spread. This recipe is vegan and gluten-free. To make the quick maple balsamic glaze, I added some balsamic vinegar and maple syrup to small sauce pan and stirred for about 5 minutes until it formed a thick glaze. You want to bring it to a boil and continue stirring until it gets thick almost like syrup. Once it’s reached a syrupy consistency, pour it over the brussel sprouts and mix. Roasting is probably my favourite way to make them but they’re also delicious steamed, sautéed and even raw, finely sliced and added to a salad. I almost always include them in my weekly food prep because they’re just so delicious and good for you! They’re also amazing just with the glaze if you don’t feel like adding anything else to them. 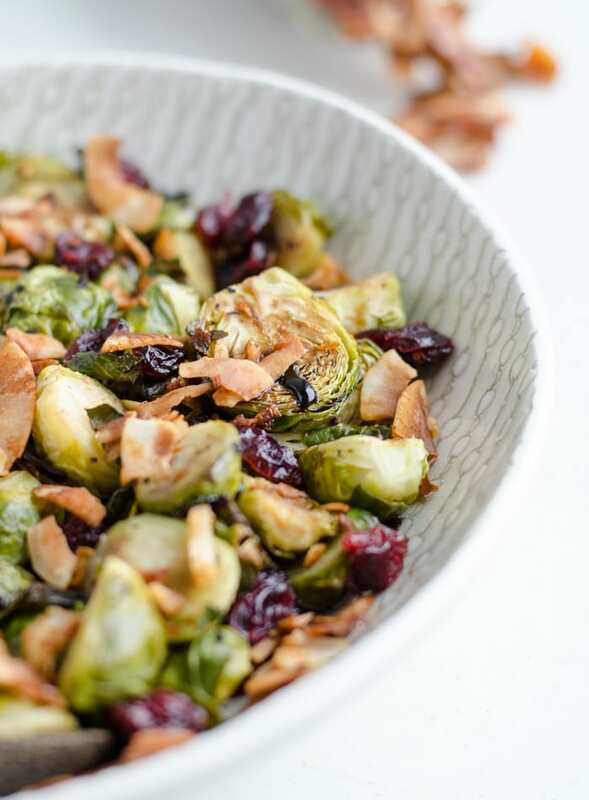 Roasted brussels require a few more steps than boiled brussel sprouts but the effort is well worth it, and even then, there’s not much effort required. If you’re feeling a little stuck with how to create a vegan thanksgiving dinner, check out my list of Vegan Thanksgiving Recipes to build your own menu. For other sides, try my Fall Harvest Salad or Coconut Mashed Sweet Potatoes. For dessert, I’d recommend my no-bake pumpkin tarts or raw maple pecan pie. If you want to try them with coconut bacon (highly recommend), you can make that days in advance. You can find a full recipe for coconut bacon here. All you need to make it is flaked coconut, maple syrup, soy sauce and spices and less than 10 minutes. The brussel sprouts could also be made in advance but I’d recommend making the Maple Balsamic Glaze right before serving as it will harden up if it sits. 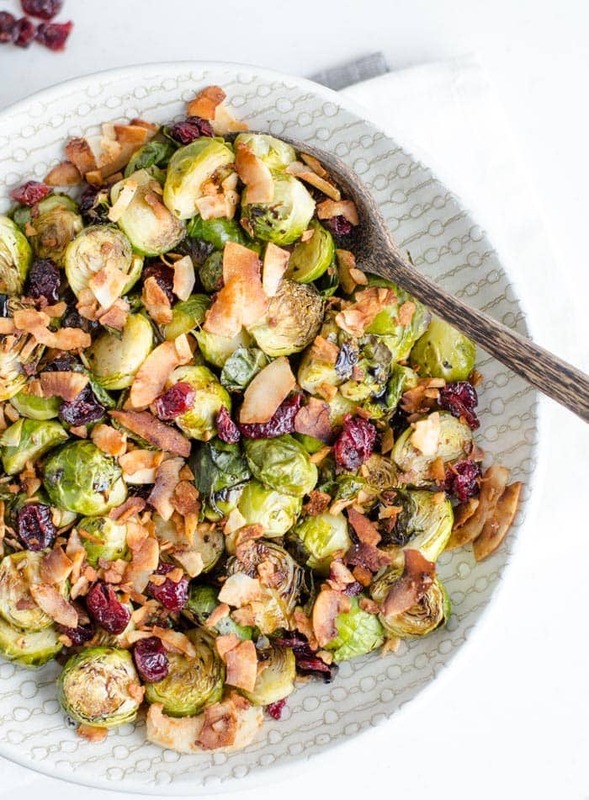 Balsamic maple glaze, sweet and tangy dried cranberries, crunchy walnuts and salty coconut bacon take these brussels to the next level. 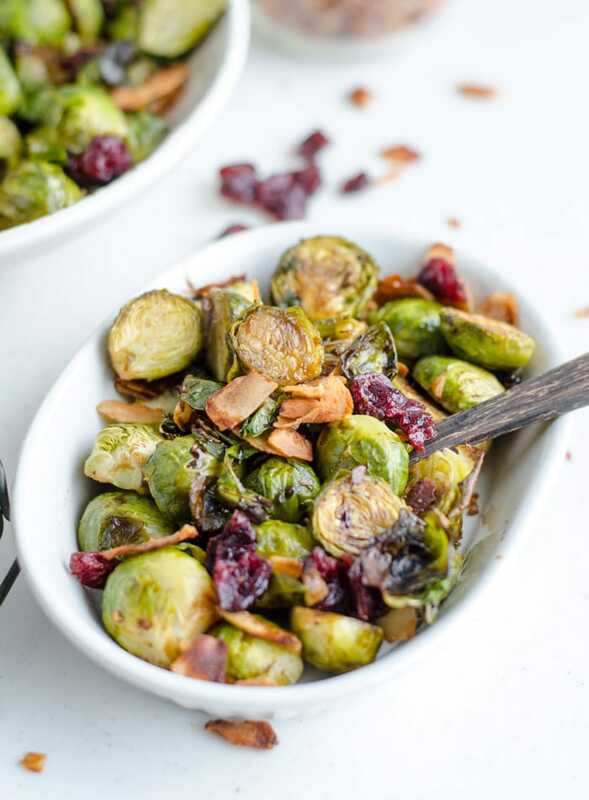 Try this recipe for your next vegan Thanskgiving menu and even brussel sprout haters will be loving it. To Make the Roasted Brussel Sprouts. Preheat the oven to 400 degrees. Wash the brussel sprouts, remove any outer leaves that aren’t looking great, cut the ends off then chop them in half. Place them on a parchment or silicone mat-lined baking sheet, drizzle with olive oil, sea salt and pepper, mix well then roast for 35-40 minutes until tender and browned. To Make the Maple Balsamic Glaze. Add the balsamic vinegar and maple syrup to a small sauce pan and bring to alight boil over medium-high heat while stirring. Continue stirring for about 5 minutes until it forms a thick, syrupy glaze. Pour over the brussel sprouts and mix to combine. Top with coconut bacon and cranberries if desired and serve immediately.